Durable vinyl, like the kind used in housing construction, is know to last a lifetime. It doesn’t weather, fade, warp or crack. Newer vinyl birdhouses are crafted with meticulous attention to detail, so much so that a customer from Cape May, NJ had called to tell me he’d received a wooden birdhouse instead! I was taken aback for a moment, thinking “these birdhouses only come in vinyl”. After assuring him these were not wood birdhouses, I asked him to knock on it and listen carefully. Finally he was convinced it was vinyl. Another customer in Fayetteville, AR, told me her horror story of two large wood birdhouses she’d ordered, costing $300 each – which had not even survived the first year! She could not recall where she’d ordered them and did not know the manufacturer. Personally…I’d be fuming! Whole-heartedly and with confidence, I assured her these birdhouses would last a lifetime. She took a chance and ordered two of the vinyl birdhouses. She was truly thrilled with her purchase and thanked me profusely! Two weeks later she bought another one of these vinyl beauties… they really do look like wood birdhouses, are worth every penny, and certainly made to last a lifetime! Providing birds critical roosting and nesting sites to raise their young can be anything but a boring wood nest box. Decorative bird houses abound out there in birdie retail land, with so many fun designs and shapes it’s hard to choose! 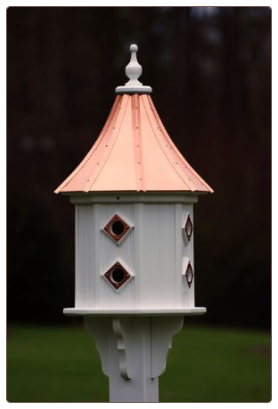 But there are some things to be aware of when choosing decorative bird houses. Wood is always a natural choice, but will it go the distance? How many seasons might it last? If it’s made in China, your chances for many seasons of successful broods may be slim. Hand crafted wood houses that are made in the USA have a far better chance at surviving over the years. Ceramics and stoneware are sturdy materials that won’t break down over time. There are some great artists creating wonderful pieces of functional art like decorative bird houses. As long as the house is equipped with adequate ventilation and proper drainage it’s a good choice. The entrance must be correctly and proportionally-sized for the birds you’d like to attract as well. Adding some nesting material nearby will also encourage birds to take up residence in your yard. And as always, a fresh water water source will entice more feathered friends than any house or feeder alone…. Happy Birding! unique birdhouses for fantastic gifts! Bluebirds are staking out houses in hopes of attracting a female, buds are appearing on trees, and bulbs are now sprouting. This could only mean spring is around the corner. I’m so ready for spring! It’s been a warm few days, but likely just a teaser. The dreaded cold snap will hit again-damaging all tender vegetation. But resident wild birds are pretty well-adapted to these kinds of weather changes. Help them thrive by providing proper nesting sites, a very scarce commodity. Unique birdhouses that are totally fun and functional, with ventilation, drainage and clean-outs help provide these critical nest sites birds so desperately need. 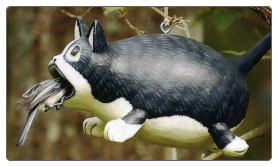 Competition for bird houses from non-native species has taken it’s toll on our own cavity-dwelling birds. European Starlings and English House Sparrows are wicked in their destruction of Bluebird and Purple Martin eggs. Got someone on your list who’s due for a gift? 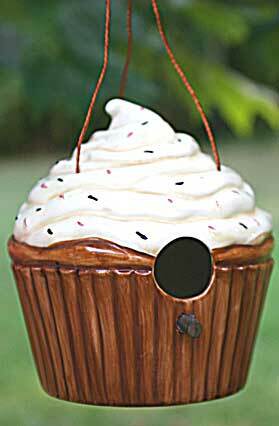 Unique birdhouses make long-lasting and practical gifts to be enjoyed for many seasons. Putting a smile on your friend’s face while helping wild bi rds to thrive and flourish… what better gift for any nature enthusiast? It takes all kinds…at a tube bird feeder! 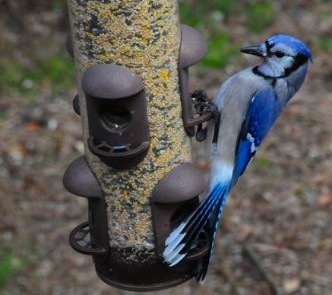 Of all the different seeds available for wild bird feeding, it seems a basic mixed seed attracts a good variety of birds. 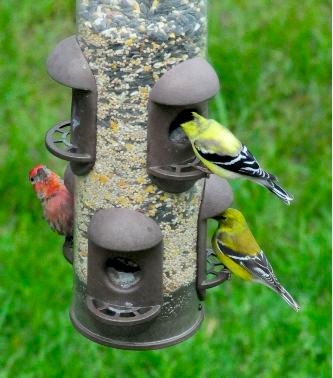 With a mixed seed in a tube bird feeder, you can expect to see all kinds! 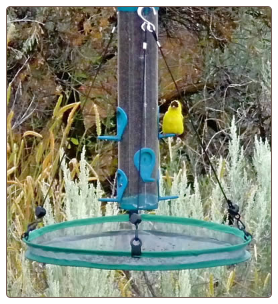 Goldfinches and a Purple Finch share this tube bird feeder in harmony. Only seconds later, this juvenile Blue Jay stopped by for a bite to eat too. Pretty nondescript, it’s your basic tube model. But there are some really cool tube bird feeders hand crafted by artisans, in ceramics and stoneware. The natural-themes in fun designs and sometimes vivid colors can tend to add a great focal point in the garden or landscape. So if you’re looking to add another feeder, or a first feeder to entice feathered friends… consider a tube bird feeder for a good variety of visitors! This Season for Seed Catchers! I just don’t get it sometimes, because every year I promise myself to install seed catchers underneath my feeders, and every year I just clean up the mess below instead! For someone who does the backyard birding thing to the degree of overkill, you’d think these seed catchers would already be in place? Right now there are three heated birdbaths, ten in all! Feeding sunflower, thistle, suet, finch mix, live mealworms, peanuts, and oh…let’s not forget the squirrels! In summer we have two water wigglers, 2 misters and two birdbath drippers going too. By the way, the birds and butterflies really love the leaf misters! Beside the unsightly mess below feeders, old seed becomes molded and poses a health hazard to the immediate bird population. 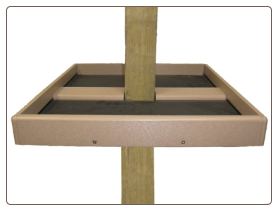 Spreading fungus and airborne diseases is never good.The added platform space from a seed catcher virtually creates an additional feeder for birds who may not perch at the main feeder. 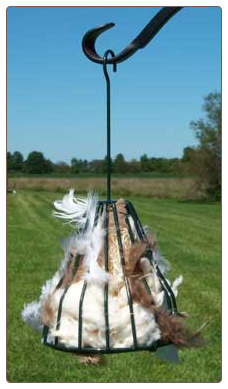 Available for 4×4 posts, standard 1-inch diameter poles, and adjustable hanging seed catchers, there’s just no more excuses for accumulated ground mess. 2011 Great Backyard Bird Count! February 8, 2011—The 14th annual Great Backyard Bird Count is coming up February 18–21, 2011. People of all ages and skill levels are needed to count birds in their yards, neighborhoods, or other locations across the United States and Canada. Simply tally birds for at least 15 minutes on any day of the count, then go to www.birdcount.org and enter the highest number of each species seen at any one time. Coordinated by the Cornell Lab of Ornithology, Audubon, and Bird Studies Canada, the count provides an instantaneous snapshot of birdlife across the continent for all to see. Anyone can watch as the tallies come in at www.birdcount.org. Organizers hope to receive more than 100,000 checklists during the event, with tallies of more than 600 bird species in all. Last year’s participants reported more than 1.8 million American Robins, as well as rarities such as the first Red-billed Tropicbird in the count’s history. “When thousands of people all tell us what they’re seeing, we can detect changes in birds’ numbers and locations from year to year,” said Dr. Janis Dickinson, director of Citizen Science at the Cornell Lab of Ornithology. “While this is the depths of winter in most of Canada and only the hardiest birds brave the cold, understanding of trends in the distribution and abundance at this time of year is important as well,” said Dr. George Finney, president of Bird Studies Canada. Data from the Great Backyard Bird Count can provide an early signal of changes in bird populations. Past counts showed a drop in reports of American Crows after outbreaks of West Nile virus in 2003, a finding consistent with studies showing crow populations declined by 50–75% in some states. Maps from the count have also captured the paths of migrating Sandhill Cranes and recorded the dramatic spread Eurasian Collared-Doves. Introduced to the Bahamas in the 1970s, the species was reported in just 8 states during the 1999 GBBC. A decade later, it was reported in 39 states and Canadian provinces. …And the Last Lion is Rescued! LOS ANGELES, Feb. 8, 2011 – The number of lions being airlifted on the record-breaking Animal Defenders International (ADI) airlift, known as Operation Lion Ark, rose this weekend to 25. A specialist ADI team flew down to Tarija in southern Bolivia and returned with an elderly lion called Kimba. At the zoo the ADI team had to break down a wall and cut through metal railings to get to Kimba, but he was soon lured into the travel crate by ADI President Jan Creamer. He was then driven to the airport, with members of the Tarija public applauding on the roadside, and loaded onto the TAB cargo aircraft. It was a smooth hour flight back to Santa Cruz, during which Kimba was very relaxed and showed no signs of stress, before a slow drive to the ADI Operation Lion Ark compound. The ADI team, including a vet, joined Kimba on the flight and were able to monitor him throughout. In the ADI compound Kimba saw and heard other lions for the first time. He went straight into his new holding cage and had a meal before calling to the other lions. Jan Creamer said: “Kimba seems a lovely, gentle old lion. He is very thin, blind in one eye, and has not seen or heard anther lion for eleven years. Once we lured him into the travel crate he settled quickly and remained relaxed throughout the flight and journey to the ADI Lion Ark compound in Santa Cruz. He’s had a sad lonely life and really deserved a break, so he is the perfect lion to be number 25 – the last lion to be saved during this huge seizure operation. The lions which have been rescued from circuses after Bolivia banned the use of animals in circuses will be heading for a new life at The Wild Animal Sanctuary near Denver Colorado where ADI is funding the construction of new facilities on 80 acres (over 32 hectares) of land supplied by the sanctuary. The huge rescue operation – the first time a country’s animal circus industry has been shut down in this way – last week attracted the backing of a number of celebrities including Bob Barker, Jorja Fox, Brian Blessed, Twiggy, Joanna Lumley, Julia McKenzie, and Benjamin Zephaniah, along with Meg Mathews, Wendy Turner Webster and Prunella Scales, who have called on the public to send donations to help the rescue. For more information visit: www.savethelionsappeal.com, or call (323) 804-9920. Most birdhouse kits are pretty straight-forward, in pine, or possibly cedar, they represent a pretty typical-looking nest box. Plenty of folks show an interest for birdhouse kits with more detail, like windows, porch railings and trim work, but no companies we know of have yet to manufacture something like that. I met someone who hand crafts these fun birdhouses and inquired about offering them as kits instead. They would be a hoot to paint, in solid colors, or prints, or even patterns. 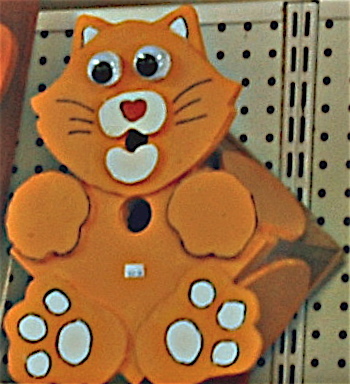 The Cat Birdhouse Kit could be painted to resemble a person’s cat, while the frog birdhouse kit could be anything the imagination desired. 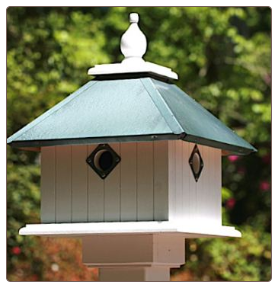 Totally fun and functional, these provide a proper nesting site for feathered friends. Complete with ventilation, drainage and clean-out, they’ll host many successful broods over the years! 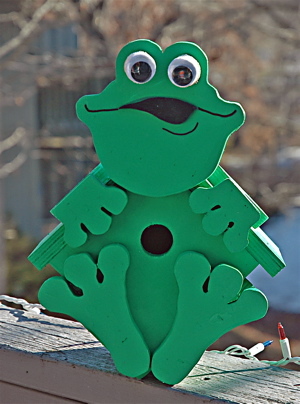 A great youth or family project, fun birdhouse kits like these help to capture a child’s attention, thus an avenue for teaching about wildlife, our environment and the importance of stewardship. 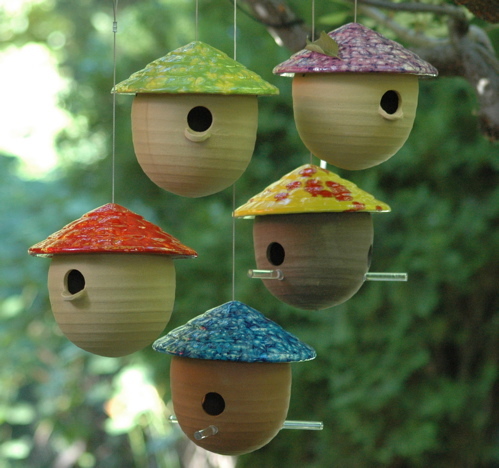 Look for these great birdhouse kits…coming soon! 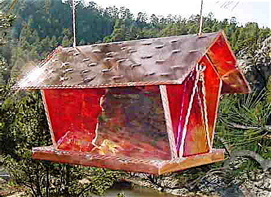 Now glass birdhouses may not be such a great idea as severe weather conditions can wreak havoc on inside temperatures. Extreme heat (if in the line of direct sun) may not be so healthy for eggs or hatchlings. Glass bird feeders on the other hand, can add a fantastic focal point to the garden or yard. True works of art, the hand crafted glass bird feeders feature a long lost kind of art, and it shows in the craftsmanship. 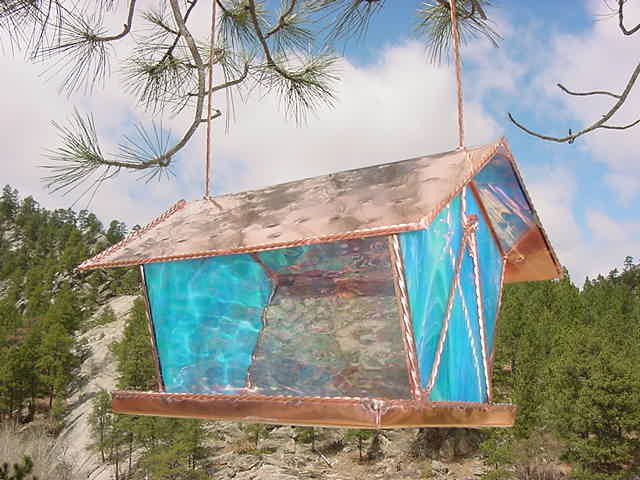 This copper and stained glass bird feeder features a hand hammered roof, and the generous tray allows for multiple perching spots so several birds can feed at once. The overhang roof helps to protect seed form the elements, while the large capacity hopper holds several ponds of any seed mix. This artist features several vibrant hues of stained glass, and custom work is always a pleasure to create. If you’re stumped for a great Valentine’s gift that will last for years… and actually be admired and enjoyed, consider a work of art – a one-of-kind glass bird feeder in your choice of colors!